What happend to the statues of Saddam Hussein? 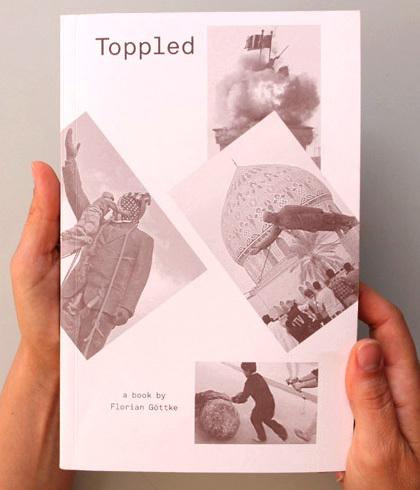 Toppled is based on hundreds of press and amateur photographs of the statues of Saddam Hussein, collected from the Internet. From this digital archive Göttke created this iconographic project, in which he analyzes and comments on the motives of the actors and the effects of the images from the viewpoints of politics, the media and image studies. Alfredo Cramerotti, curator: "The book is fascinating (for the media construction of history), precise (without being overwhelming), simple (with an amazing eye for text-image layout and coordination), critical (no chances are left to make the reader self-reflecting on his/her previous experience of the same narratives) and 'universal' in the best sense (this approach is focused on a very tiny part of our civilization; yet, it embraces it all)."